Gardenias are frost-tender evergreens, and they bloom in late spring to early summer. The bushes grow to 3 feet high with glossy green, oval-shaped leaves. While the bushes are attractive, flowers are the main attraction. The white flowers look like flattened roses from 2 to 3 inches across. They are highly fragrant. One gardenia will scent an entire room. They last about a week when cut. The stems are short, so use them in small arrangements, by themselves floating in a bowl or in corsages. Choose a location that gets afternoon shade, dappled shade or shade all day. Gardenias won't bloom in deep shade, so it's a fine line between too much shade and not enough. Dig the soil to a depth and width of 24 inches. Break up any clods of soil. Remove any caliche, which is common in Arizona soils. Caliche is a hard substance that looks like dirty sandstone. You may have to use a pick axe to break it up. Caliche prevents good drainage. Add 1 cup of gypsum per hole. Arizona soils are very alkaline, and the gypsum counteracts the alkalinity. Mix 1/3 compost, 1/3 top soil and 1/3 removed soil, as well as a product that adds iron to the soil per package directions. Refill the hole, and water well. Dig a hole as big as the gardenia container. Remove the gardenia from the container and plant. Cover the container soil with 1/2 inch to an inch of the amended garden soil. If you don't, the container soil may dry out faster. Water every other third day during the hot summer months and once a week during the cooler winter months. Flush the soil every month by letting the water trickle for at least an hour. Arizona water has high levels of salts and minerals. These build up in the soil. Gardenias prefer acid soil, so flushing every month gets rid of the salts and alkalinity. 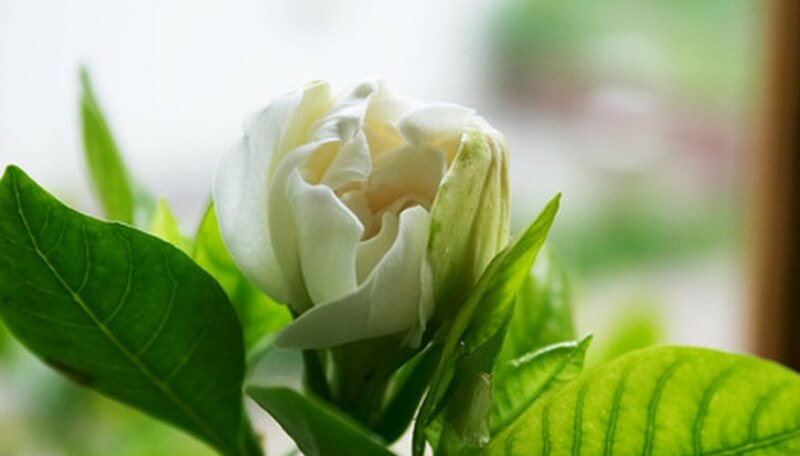 Feed the gardenia with a plant food high in phosphorous and low in potassium. Once a week, watering with strong tea helps the soil stay acid. Watch the leaves as a sign of the gardenia's health. All yellow leaves mean the plant needs nitrogen. Yellow leaves that have green veins means the plant needs iron. Feed with a product that contains iron chelate. The plant can't take up the iron if the soil is always damp, so extend the time between waterings if possible. Mulch to conserve moisture. Day temperatures in Arizona consistently reach over 100 degrees F in May through September. Products containing iron chelate will stain your hands, clothing and patios. Gardenias are a challenge to grow in Arizona.